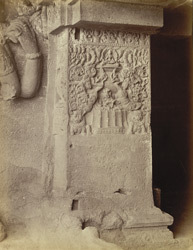 Photograph of a carved base of a pilaster in upper storey of the Hindu Cave XV (Dasavatara) at Ellora in Maharashtra, taken by Henry Cousens in the 1870s. Ellora is renowned for its series of Hindu, Buddhist and Jain cave temples excavated into the face of a basalt cliff. This cave was started as a Buddhist monastery, but in the 8th century was converted into a Hindu sanctuary under the patronage of the Rashtrakuta king Dantidurga (c.730-55). It consists of an open court with a free-standing monolithic mandapa in the middle and a two-storey temple at the back. The temple at the rear was the original Buddhist monastery, the walls of which were covered with relief sculptures illustrating Hindu mythology. The pilaster in this view is carved with an exuberant decoration of figures, foliage and animals.